Even a city as cosmopolitan as New York can taint simple pleasures. For lovers of chai, that tainting starts with language: “Chai tea” translates into “tea tea,” and “iced chai tea latte” translates to … nothing. There is also the chai itself, which is often loaded with sickly syrups that take the subtle perfume of real chai and turn it into something that tastes more like Cinnamon Toast Crunch. Thankfully, the Chai Spot, which opened a few months ago on a strip of Mott Street where Little Italy and Chinatown intersect, offers an exception. The tea dhaba’s play on classic masala chai offers cardamom with a warm, clean finish that’s uplifted by citrus tones. 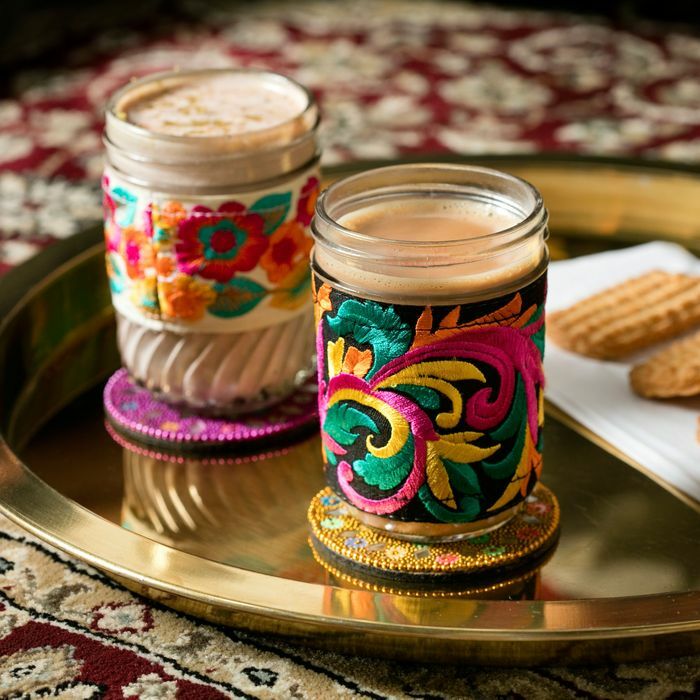 There’s no butter in the butter chai, the pink-hued, gunpowder-based homage to Kashmiri chai, but the made-to-order option is nevertheless made lush with the addition of milkfat, finished with a touch of salt and a garnish of crushed almonds. The coconut-milk-based coconut rose tea is a smooth, lightly floral concoction for the dairy-averse. Other milk-free and vegan-milk-free options include sulaimani tea, which is sweet and heavily spiced with star anise. The iced orange-blossom tea, meanwhile, is delicate, honeyed, and palate-cleansing. The Chai Spot is also an exception to the get-in-get-out mentality at most of the city’s tea and coffee shops. “To-go” is not a thing at the Chai Spot. Instead, you approach the front counter, where steel vats of freshly brewed chai simmer behind a glass case of cake rusk, Parle-G biscuits, and bags of masala Lays. You order your chai, which is served in a glass jar encased within a sequined sleeve. Then, past a hallway of hand-embroidered kameezes and trinkets, you reach the back lounge: a rent-defying, mirrored hall of paisley prints, ottomans, and oriental rugs. You remove your shoes and enter, with the tacit understanding that you’ll be staying a while. “We give our guests a place to relax and make new friends, and see the world through chai-colored glasses,” says Khalida Brohi. 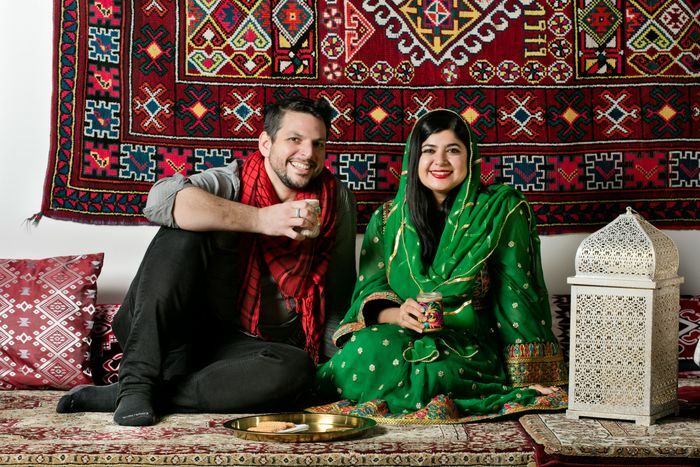 “Everything is colorful, beautiful, and happy.” Brohi is a Pakistani women’s-rights advocate who co-founded the New York dhaba with her husband, David Barron, following the success of their first location, in Sedona, Arizona. Photos tagged #thechaispot pop up on Instagram with the kind of hypercolorful visual appeal that looks custom-made for the social platform. But the decorations at this dhaba are more than eye candy, and, among the opulence, copies of Brohi’s 2018 memoir, I Should Have Honor, line bookshelves. The book itself is about the honor killing of a young female cousin in Brohi’s family, an act of violence that galvanized her career in gender justice. In addition to running the two Chai Spot locations, she is the head of the Sughar Foundation, a Pakistani nonprofit that supports women entrepreneurs and craftsmanship through micro-grants and training (the kameezes and trinkets out in front are all the handiwork of Sughar women). Brohi also founded the Khadija primary school, named in honor of her cousin, Khadija, and dedicated to co-education in an underserved Pakistani community. These are not initiatives that exist apart from the Chai Spot, either: half of the proceeds from the dhabas are dedicated to supporting these causes. “The best way to eradicate harmful customs is to promote good ones,” Barron maintains. There’s no guarantee that customers who arrive looking for some tea and relaxation will pick up on the lounge’s gender-justice message, but the dual purposes have a way of mixing, anyway. On a recent afternoon, on a pair of ottomans in the back lounge, a mother and daughter dutifully snapped photos of their cardamom chais before meandering over to one of the bookshelves. The daughter picked up one of the many copies of Honor and took it back to her seat. She and her mother continued sipping their chais while leafing through the memoir with the casual ease of a light read.